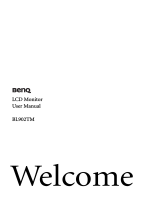 BenQ Corporation to notify any person of such revision or changes. вЂў The AC plug isolates this equipment from the AC supply. socket outlet should be installed near the equipment and be easily accessible. are not sure of the type of power available, consult your dealer or local power company. source, or in a built-in installation unless proper ventilation is provided. вЂў Never push objects or spill liquid of any kind into this product. material selection, manufacturing, packaging, transportation, using and disposal of the products. please contact the place of purchase for a replacement. monitor. The fitted foam packing is ideal for protecting the monitor during transport. Always keep the product and accessories out of reach of small children. вЂў Above diagram may vary depending on the model. вЂў Picture may differ from product supplied for your region. вЂў If the computer is turned on you must turn it off before continuing. Do not plug-in or turn-on the power to the monitor until instructed to do so. 1. Attach the monitor base. monitor packaging bag on the desk for padding. the monitor stand arm upwards clear of the monitor. minimize unwanted reflections from other light sources. 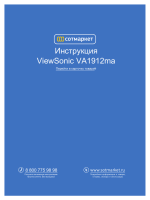 without the ferrite filter) to the monitor video socket. ferrite filter) to the computer video socket. accidently falling out during use. 3. Connect the power cable to the monitor. connect the other end to a power outlet just yet. 4. Route the cables via the cable clip. place behind the monitor stand. 5. Connect-to and turn-on the power. outlet and turn it on. the right of the monitor. 12 to install the monitor software. that you use your computer's power management function. 1. Prepare the monitor and area. unplugging the monitor signal cable. on a flat clean padded surface. monitor base from the monitor stand arm. please read the precautions carefully. вЂў Install your monitor and monitor mounting kit on a wall with flat surface. вЂў Ensure that the wall material is stable to support the weight of the monitor. вЂў Turn off the monitor and the power before disconnecting the cables from the LCD monitor. 1. Remove the monitor base. detach the base on page 10.
screws somewhere safe for future use. 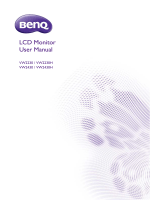 BenQ LCD Monitor driver software as provided on the BenQ LCD Monitor CD-ROM. installation (which already has existing monitor driver software) with a newer monitor. hardware, and will launch its Found New Hardware wizard. вЂў How to install the monitor on a new computer on page 13.
вЂў How to upgrade the monitor on an existing computer on page 14. Administrator or as a member of the Administrators group in order to install the monitor driver software. policy settings may prevent you from installing software on your computer. 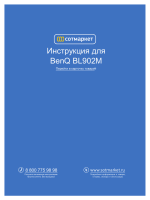 вЂў To check the name of the purchased model, refer to the specification label on the back of the monitor. BenQ LCD Monitor is the first ever monitor to be connected to it. should instead be following the instructions for How to upgrade the monitor on an existing computer. 1. 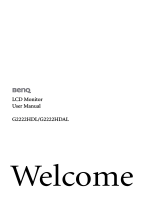 Follow the instructions in How to assemble your monitor hardware on page 7. Check Search for a suitable driver for my device option, and click Next. Check the option for CD-ROM drives (uncheck all others) and click Next. To find the suitable driver files for the purchased model, refer to the following table. Windows 8 and Windows 7 Operating System (OS). cannot guarantee its operation on those systems. you through the file selection and installation process. вЂў How to install on Windows 8 system on page 15.
вЂў How to install on Windows 7 system on page 16.
and right-click the name of your monitor from the menu. Click Generic PnP Monitor, and then the Properties button. Click the Driver tab and the Update Driver button. the drive letter designator for the CD-ROM drive). 'D:' or 'E:' or 'F:' etc. 9. Select the correct folder name of your monitor from provided driver list, and click Next. This will copy and install the appropriate monitor driver files to your computer. You may be prompted to restart your computer after the driver update is complete. name of your monitor from the menu. key function. Press the AUTO key to optimize the currently displayed image to the screen. when you use the AUTO key function. can use to check for screen color, grayscale and line gradient display. you run auto.exe, a test pattern displays. 2. Press the AUTO key on the monitor. 3. Press the MENU key to access the monitor On-Screen Display (OSD) menu. keys to select DISPLAY and press the ENTER key to enter the menu. keys to adjust the monitor until the noise disappears. 1. AUTO: Adjusts vertical position, phase, horizontal position and pixel clock automatically. 2. MENU key: Activates OSD main menu and return to the previous menu or exit OSD. /Mode key: For Left/Decrease adjustment. The key is the hot key for Mode. 4. Power : Turns the power on or off. 6. ENTER key: Enters sub menus and select items. Hot key mode on page 19.
whenever the menu isn't currently displaying on-screen. To exit, press the MENU key. See also Picture Mode on page 24. You can use the OSD (On Screen Display) menu to adjust all the settings on your monitor. options that are not available will become grayed out. Press the MENU key to display the following main OSD menu. different OSD menus are available. вЂњOSD SettingsвЂќ for more details. key to enter the menu. the ENTER key to select that item. for you. The AUTO key is a вЂ�hot make adjustment. key to decrease the contrast. softness effect on the display. Color - Press ENTER to enter the Color menu. Decreasing one or more of adjust the value. color tint of the image. (e.g. Press MENU to leave the Color menu. вЂў Movie - for viewing videos. such as printers, DSCs, etc. the ENTER key to enter the menu. allow aspect ratios other than change the settings. OSD Settings - Press ENTER to enter the OSD Settings menu. position of the OSD menu. Press MENU to leave the OSD Settings menu. the correct resolution, refresh rate and make adjustments based on these instructions. How do you use a VGA extension cable? conduction quality or with a built-in booster. Does the blurring only occur at resolutions lower than the native (maximum) resolution? more pixels are permanently red, green, blue or another color. вЂў Clean the LCD screen. It has a yellow, blue or pink appearance. message box to reset the color settings to the factory defaults. any pin is bent or broken off, please contact your dealer to get necessary support. Is the prompt on the display illuminated in green? the link "Adjusting the Screen Resolution". power "sleep" mode when not actively in use. вЂў Use a screensaver to prevent the occurrence of image retention. Is the prompt on the display illuminated in orange? Is the prompt on the display not illuminated at all? Check the power supply mains socket, the external power supply and the mains switch. You are running the monitor at its native resolution, but the image is still distorted. you can use the "Display Mode" function to set a proper aspect ratio for the input sources. See Display Mode on page 25 for details. вЂњMENUвЂќ key for 15 seconds to enter the вЂњOSD LockвЂќ option and make changes. from the вЂњOSD SettingsвЂќ menu (under SYSTEM), and all OSD controls will be accessible.